A surprisingly enjoyable end of the world SyFy Channel original from director Paul Ziller. Anchor Bay UK R2 DVD. 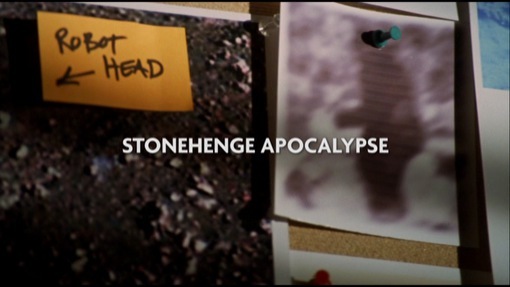 Stonehenge Apocalypse is part of a swathe of eschatological films produced in the 2000s for the video market or the ubiquitous SyFy Channel. Co-written by director Paul Ziller (also behind Polar Storm (2009)), the script here does at least take a slightly different approach to the usual meterological terrors and gives as an admittedly nutty storyline (with the usual "fringe scientist is proven right" genre cliché) but one that is treated seriously and is at least relatively consistent to itself. Most importantly, the script avoids the usual 'disaster movie' subplots with their extrenuous characters and instead focuses mostly on the scientists trying to stop the impending doom - the first half of the film is enjoyable and well paced as the scientists have to try and understand what is going on, while disasters occur around the world. The film suffers in the second half with the bizarre decision to have three characters fly to America to recover an artefact they need (given the counting clock there is no plausible reason why it could not just have been sent over in half the time needed for a return flight) only to run into a group opposed to them which just seems to exist to add some gratuitous gunfight scenes - the entire American sequence, although adding some extra threat does some across as superfluous to the storyline. Fortunately the climax is tense and there is a fitting finalé with a neat ending. Behind the camera Paul Ziller works well with the low budget, using CGI effects only when necessary (and they do look better than most of those in the genre), with a straight forward shooting manner rather than the overediting of many similar films. The historical site itself is of course a reconstruction, but doesn't look too bad and the stone moving shots look good. Stop billed is Misha Collins who does a good job as Jacob, managing to come off as suitably abrasive in the early scenes without becoming simply annoying. Peter Wingfield is the best cast, playing the lead British scientist and giving the film a real touch of class. Performances in general are solid and importantly they all play the material straight. Stonehenge Apocalypse feels a lot like an episode of the new generation Dr. Who series, particularly with Peter Wingfield (who is even referred to as Doctor at points) presaging the casting of Peter Capaldi in the role. It is a pretty enjoyable film, without the excessive padding of many genre titles and with better than average special effects and acting, it is only let down slightly by a somewhat gratuitous action subplot in the second half. Genre fans and newcomers will find plenty to enjoy here, particularly since it often falls into the "so bad its fun" category and for fans of Collins and Wingfield they get plenty of screentime. Any gore or violence ? A couple of mildly bloody deaths. Who is it for? Fans of DTV disaster films and SyFy Channel movies will certainly enjoy this. Visuals Aspect Ratio - 1.78:1 anamorphic widescreen. Colour. An entertaining little end of days film with a good performance from Peter Wingfield. A good DVD release with solid transfer and an interesting behind the scenes piece. All text in this review written by Timothy Young - 15th December 2014.